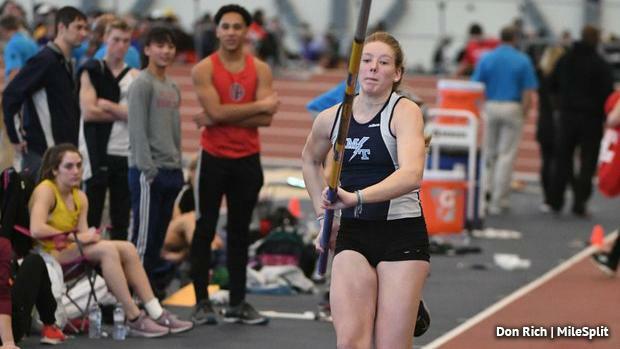 Expect another big year in the girls pole vault, as a number of vaulters should approach the 13-foot barrier (and many already have during the indoor season). The top returner from last outdoor season is Manheim Township's Sydney Horn. Now a junior, Horn jumped 12-6.25 at outdoor nationals. Her sister, Mackenzie Horn, had a season for the ages that saw her break the state record with a 13-7.25 jump at the District 3 Championships. Sydney Horn won the indoor state title with a clearance of 12-6 and then jumped her best at indoor nats (12-10.25). She was third in AAA at outdoor states last year. Two other state medalists are back from last year in AAA and both hail from District 2: Scranton Preparatory's Victoria Atkinson and Abington Heights' Danielle Heine. Atkinson (sixth at outdoor states last year) had a huge indoor season, where she won at Millrose and placed second at indoor states to Horn (also clearing 12-6). Heine (fifth at outdoor states in 2018) jumped 12-0 this indoor season, matching her outdoor best from a year ago. Lyndsey Reed of State College will be a major factor this winter in AAA. After battling injury last spring, Reed had a great indoor season, vaulting over 13 feet twice with a best of 13-1.5. She suffered a late season injury this winter, but still still took fourth at indoor states. Look for a number of girls to chase 12 feet in AAA this season, including Gabriella Recce (Central Dauphin), Cierra Crane (Central York), and Allison Riches (Hatboro Horsham) who have all jumped 11-9 or better since last outdoor season. One to watch this outdoor season is PA newcomer Liliana Cohen of Germantown Academy. She transferred in from NY for the indoor season. She took third at indoor states and then jumped 13-2.25, the best of any PA girl from the winter, at indoor nationals (she placed fourth in the nation). Cohen should dominate the PAISAA this spring. In AA, there are also a number of strong returners. Loyalsock's Hailey Zurich will aim to win her first state title. She jumped a best of 12-0 last spring and took third at outdoor states. She was fifth at indoor states this past winter. Moniteau's Kendall Grossman is the top returner based on outdoor states finish from a year ago. She went 11-6 at Ship to take second in AA. Four other AA state medalists are back from last year: Western Wayne's Trina Barcarola (third), Warrior Run's Rylie Mong (third), Delone Catholic's Danielle Malesky (sixth), and Lakeland's Corah Krantz (seventh). Barcarola has the best returning clearance out of that bunch at 11-7.25 and she was seventh at indoor states. Waynesburg Central's Taylor Shriver should be a factor this spring. She jumped 12-0 this past indoor season.